Outlook saves backup information in a variety of different locations. Depending on what type of account you have, you can back up your emails, your personal address book, your navigation pane settings, your signatures, templates, and more. If you're using a Microsoft Exchange, Office 365, or Outlook.com account, your email messages are backed up on your email server. In most cases, you won't have a Personal Folders file (.pst) for these types of accounts. In order to view some of the backup files for Outlook, you'll need to unhide system folders and file name extensions. For information on how to perform that task, see How to unhide folders and file name extensions. For Office 365 accounts, Exchange accounts, or Outlook.com, Hotmail.com, or Live.com accounts not accessed by POP or IMAP, you won't have a Personal Folders (.pst) file. You may have an Offline Folders (.ost) file, but that file is automatically recreated by Outlook when you add a new email account. You can't move that file from one computer to another. 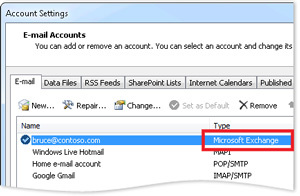 For Office 365 accounts, Exchange accounts, or Outlook.com, Hotmail.com, or Live.com accounts not accessed by POP or IMAP, the following information can be transferred from one computer to another. Any Outlook templates you've created are stored in one of two places. Templates will have an .oft extension. Your send and receive settings include which accounts are checked at what frequency. You can find your send and receive settings file in one of the following locations. The file will have an .srs extension. If you have a POP or IMAP account, all of your information is already stored in a Personal Folders (.pst) file. You can move this file to a new computer and retain your information. Moving a .pst file from one computer to another doesn't transfer your email account settings. If you need to set up Outlook on a new computer, copy your .pst file from the old computer, then set up your email account on your new computer. You can then open the .pst file from the new computer. Tip: If your Outlook Data File (.pst) becomes large it can slow down your OneDrive sync and may show "Processing changes" or "A file is in use". Learn How to remove an Outlook .pst data file from OneDrive. Note: Your configuration might not include all of these files as some are created only when you customize Outlook features. To locate Folder Options, in the search box at the top of window, type Folder Options. In Control Panel for Windows XP, type Folder Options in the Address box. On the View tab, under Advanced settings, under Files and Folders, under Hidden files and folders, select Show hidden files and folders. Outlook Data Files (.pst) contain your e-mail messages, calendars, contacts, tasks, and notes. You must use Outlook to work with the items in a .pst file. When you archive Outlook information, items are saved in a .pst files. Microsoft Exchange Server accounts save your information on the mail server. To use Cached Exchange Mode or to work offline, copies of your items are saved in an offline Outlook Data File (.ost). See the Outlook Data Files (.ost) section for more information. Also, some organizations allow you to export or archive your items to a .pst file. In Outlook 2010, click the File tab in the Ribbon, and then click the Info tab on the menu. Note the path and file name of your .pst file. For example, C:\Exchange\Mailbox.pst indicates a .pst file that is named Mailbox.pst and is located in the Exchange folder on your drive C.
Outlook Data Files (.pst) created by using Outlook 2010 are saved on your computer in the Documents\Outlook Files folder. If you are using Windows XP, these files are created in the My Documents\Outlook Files folder. If you upgraded to Outlook 2010 on a computer that already had data files created in previous versions of Outlook, these files are saved in a different location in a hidden folder. Tip: For information about hidden folders in Windows, see Windows Help and Support. On the Mail Setup tab, click the Data Files button. Note the path and file name of your .pst file. For example, C:\Exchange\Mailbox.pst indicates a .pst file that is named Mailbox.pst located in the Exchange folder on your drive C.
5. Click Close, click OK, and then click Exit and Log Off on the File menu to quit Outlook. On the Start menu, point to Programs, and then click Windows Explorer. Browse through the files to the location of your .pst file. Copy your .pst file to the location that you want. Click the Start button, and then click Help. Click the Search tab, and then type copy. In the Select Topic to display box, click Copy or move a file or folder. Click the File tab on the Ribbon, and then click the Info tab on the menu. Click the Accounts Settings tab, and then click Account Settings again. On the Data Files tab, click Add. Under Save as type, select Outlook Data File (*.pst). Find the new location for your .pst file, and then click OK. Select the .pst file, and then click Set as Default. You have changed the default deliver location for your e-mail. This will change the location of your Inbox, Calendar, and other folders. These changes will take effect the next time you start Outlook. 10. Click the .pst file that was identified in the "How to Identify the Name and Location of Your Personal Folder File" section, and then click Remove to remove the local .pst file from your profile. 11. Click Yes, click Close, and then click OK to close all dialog boxes. 12. On the File menu, click Exit. Your profile now points to your .pst file in the new location. Outlook opens your new .pst file, and you can now delete the .pst file from its old location. On the Mail Setup tab, click the E-mail accounts button, even if you do not have an email account specified. Click Office Outlook Personal Folders File (.pst), and then click OK.
Find the new location for your .pst file, and then click OK two times. The location that messages are delivered to has changed for this user profile. To complete this operation, you may need to copy the contents of the old Outlook folders to the new Outlook folders. For information about how to complete the change of your mail delivery location, see Microsoft Outlook Help. Some of the shortcuts on the Outlook Bar may no longer work. Do you want Outlook to recreate your shortcuts? All shortcuts you have created will be removed. Click Yes to have Outlook update the Outlook Bar shortcuts so that they point to your new .pst file location, or click No to leave the shortcuts for your original local .pst file. The .ost file is synchronized with the items on the server that runs Exchange. Because your data remains on the Exchange server, you can re-create this .ost file on your new computer without having to back up the .ost file. Note: Personal Address Books (.pab) are not supported in Outlook 2010. When you upgrade to Outlook 2010, you are prompted to import any .pab file into Contacts. If you choose not to import the .pab file when you first run Outlook 2010, you can import it later by using the Import command in the Microsoft Office Backstage view. The Offline Address Book (.oab) is used by Microsoft Exchange Server accounts. It contains information, such as names, e-mail address, titles, and office locations, from the Global Address List (GAL) on the server that runs Exchange. You do not have to back up or restore this file. This is file is created and updated automatically. This file includes information about the contents of the Navigation Pane. The Auto-Complete List is a feature that displays suggestions for names and e-mail addresses as you begin to type them. These suggestions are possible matches from a list of names and e-mail addresses from the e-mail messages that you have sent. In Outlook 2010, the Auto-Complete List file (.nk2) is discontinued. The Auto-Complete List entries are now saved in your Microsoft Exchange Server mailbox or in the Outlook Data File (.pst) for your account. If you are using an Exchange Server account, your Auto-Complete List is saved in your mailbox on the server that runs Exchange. This enables your Auto-Complete List to be used from any computer that you use Outlook with your Exchange account. How can I tell if I have a Microsoft Exchange Server account? Click the File tab. Click Account Settings, and then click Account Settings. On the E-mail tab, the list of accounts indicates the type of each account. The Auto-Complete List is saved in the Outlook Data File (.pst). See the section Find and transfer Outlook data files from one computer to another for location information. The Auto-Complete List is saved in the Outlook Data File (.pst). The Outlook Data Files (.pst) for these account types differ from other Outlook Data Files (.pst) in Outlook. These files are used as copies of information on your mail server account and not intended to be moved or restored. A new Outlook Data File (.pst) is created when you configure an IMAP or an Outlook.com (formerly Hotmail) account in a different Outlook profile or on another computer. Your Auto-Complete List, therefore, is unique to the computer and profile where the account is set up and the entries do not appear in any other profile or computer that you use. Note: If you upgraded to Outlook 2010 from a version of Outlook earlier than Microsoft Outlook 2002, you might have an .rwz file on your computer's hard disk drive. The .rwz file is no longer needed, and the information about rules is now kept on the server running Microsoft Exchange, and in the Outlook Data File (.pst) for POP3 and IMAP e-mail accounts. You can delete the file. If you use the Rules Import and Export feature, the default location for .rwz files is your Documents folder. In Windows 10, right-click the Start button, and then click Control Panel. In Windows 8, press the Windows key + X, then click Control Panel. In Windows 7, click Start > Control Panel. In the View by list, make sure either Large icons or Small icons is selected so that you can see all the icons in Control Panel. Under Hidden files and folders, click the Show hidden files, folders, and drives button.